I received a very nice email, and photo, from Jhe. In it she said, "I only started cooking a few weeks ago and I'm getting better by the day. 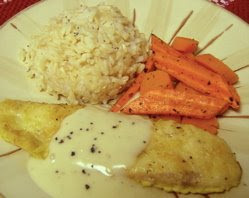 Tonight, I made your recipe for Sole Dore but used tilapia instead. I also didn't have capers so I made a simple lemon butter sauce. I attached a picture so you can see. My husband LOVED it and he's not a big fish fan. ...Please continue doing what you do." All my usual kidding aside, these are emails that inspire me to keep doing what I do. Thanks! I don't normally visiting 'food and cooking' sites even though I do enjoy cooking myself which I frequently make for my wife. I was inspired by your site which I thought was very well done with very simple to follow recipes, great video, and I think both your food and site are very healthy. I added you to my daily RSS, and I should add a review on my artOsphere blog. those almost look like your Chinese 5 spice carrots, mmm - those are really good. "disgustingly handsome teacher" I think you got half of that right! I am interested to get such emails. Is anyone else have an issue with viewing the recipe video? I really want to make this for dinner tonight but I am unable to view but the picture. :( Any help would be greatly appreciated!